Posted on March 3, 2019 by AHGTC webmaster Posted in News	. The funeral arrangements for Dennis Capewell. Consort to Peterborough’s Town Crier Pearl Capewell. Tuesday 19th March at 1230hrs at St Oswald RC Church, 933 Lincoln Rd, Walton, Peterborough, PE4 6AE. Criers are more welcome to attend in full regalia for a guard of honour outside the church. Any Crier who wishes to attend please contact the Guild’s Almoner, Trevor Heeks. Posted on November 14, 2018 by AHGTC webmaster Posted in News	. A spiffing shiny new edition of the crier will be with our members very soon. Awesome front cover! Members of the AHGTC receive the crier magazine twice a year. It is packed with news, articles, advice and anything related to the world of Town Criers. 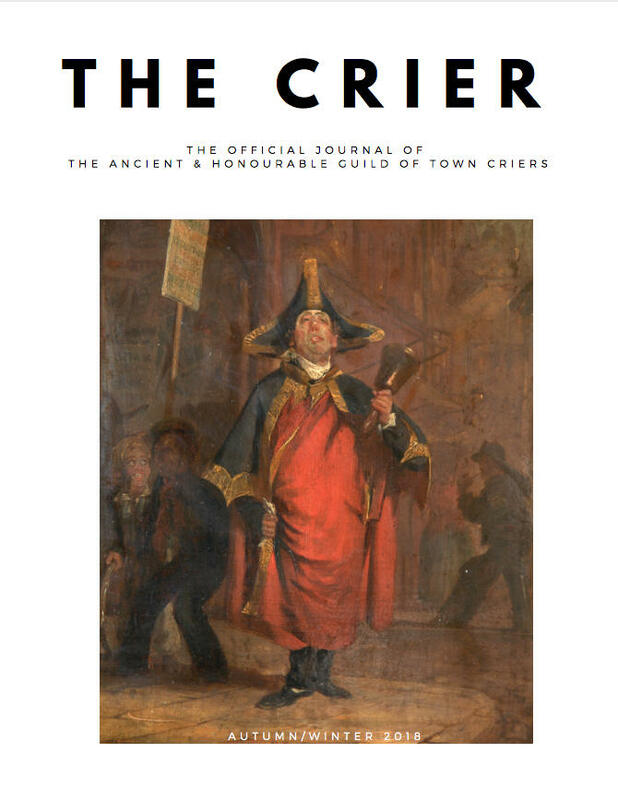 The Crier Magazine is another great reason to join the Ancient and Honourable Guild of Town Criers, the world’s largest association of Town Criers. Posted on October 17, 2018 by AHGTC webmaster Posted in News	. Posted on November 9, 2017 by AHGTC webmaster Posted in News	. It is with great sadness that I have to inform you of the passing today 8th November 2017 of Jose, Wife of David Fry Town Crier of South Gloucestershire. No further details are known at this present time.